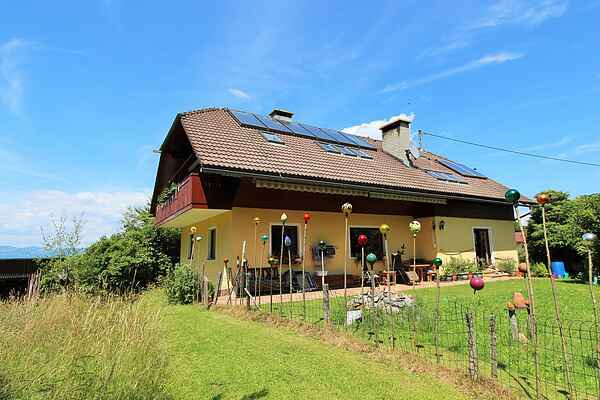 This very spacious and fully equipped 3-bedroom apartment is situated on the first floor of a house with an organic farm, in a very tranquil location in the beautiful and sunny south of Austria. An exterior staircase provides access to your holiday home, which offers plenty of space for 5 people. The large living/dining room with open-plan kitchen is very fully equipped. The biggest bedroom has a double bed, the kids room has a bunk bed and the third room has a large single bed. Two bedrooms have access to the balcony. The modern bathroom even has a washing machine. The garden surrounding the house has an organic farm with donkeys, sheep and chickens. So you can enjoy fresh eggs from the farm's own chickens with your breakfast. There is also garden furniture of course. There are lots of hiking options; the Rauschelesee is a 35-minute walk and the Wörthersee is a short drive away - as is Slovenia! Come experience a wonderful holiday in Carinthia, the sunniest part of Austria, and relax among the region's mountains and beautiful lakes. In the immediate vicinity is a horse riding school. After an appointment, you can horseback ride here.